More than 300 people attended the Changing Times: Creating Justice for Refugees forum. A forum aimed at supporting and protecting the rights of refugees was attended by more than 300 people. An expert panel discussed the plights of refugees and other ideas at the Changing Times: Creating Justice for Refugees forum initiated by local refugee advocacy group, Bellarine for Refugees, and organised by Deakin University in collaboration with Refugee Legal, Barwon Community Legal Service and Combined Refugee Action Groups (CRAG). Deakin University’s vice chancellor professor Jane den Hollander introduced the speakers and the conversation was moderated by professor Greg Barton, also from Deakin. The speakers were David Manne from Refugee Legal, professor Gillian Triggs, former president of the Australian Human Rights Commission, and academic and former UNHCR Assistant High Commissioner for Refugees, Professor Erika Feller, all of whom have extensive experience working for justice for refugees here in Australia and overseas. The panel spoke about what are governments in our region and beyond are doing to resolve the issues surrounding how to best manage the roughly 68 million displaced people worldwide in ways which respect their human rights and dignity. Their ideas ranged from the need for Australia to adopt a Charter of Rights to protect vulnerable members of the community, to the value of collaboration between community-based refugee advocacy groups and legal centres, and current initiatives to find global solutions through the UNHCR’s Global Compact on Refugees to which our government is a signatory. 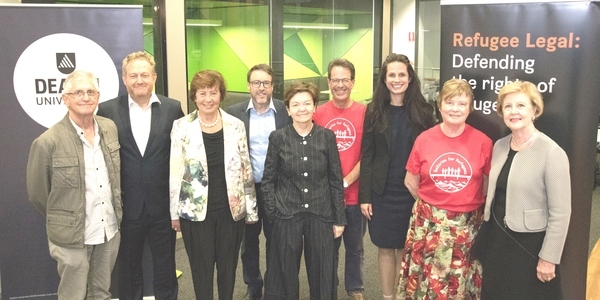 “It was wonderful to see the capacity crowd so completely engaged with these three highly regarded experts in the fields of refugee law and policy,” co-founder and previous chair of Bellarine for Refugees Margaret Griffith said. “All speakers called for a more compassionate refugee policy environment. If you are interested in finding out more about Bellarine for Refugees, contact bellarine4r@gmail.com or follow them on Facebook.